Broken teeth are not simply a cosmetic issue. Left untreated, they can lead to other health problems such as general tooth decay, bad breath, and gum disease. Gum disease in turn causes numerous health ailments including heart disease and rheumatoid arthritis. A broken tooth can be treated in several ways. 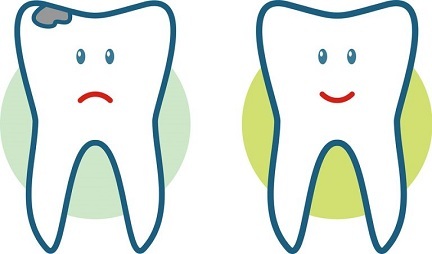 A dentist may recommend getting a dental crown (a tooth–shaped cap) when there is visible structural damage to the tooth, but the tooth is still intact at the root. The cap goes over the broken tooth becoming its new visible surface. It acts to protect the health of the broken tooth and improve the tooth’s appearance. A dentist will take x-rays before placing a crown on a broken tooth. If the tooth has extensive decay, the dentist may recommend a root canal before placing the crown to prevent infection. Before creating the crown, the dentist will make an impression of the tooth to ensure that the end result is as natural looking and natural feeling as possible. This is normally a two week process, so the patient will be fitted with a temporary crown while the permanent crown is being created. Or contact Dr. Medina’s Las Vegas office to schedule a consultation.